Click to see a few other pics from Belgianfest. This past weekend’s third annual Belgianfest was quite the event. It gave Washington breweries a chance to have fun and show the hopped-up, IPA-loving throngs of local beer drinkers what else is out there. The change to a new venue at the Bell Harbor International Conference Center, located right on the downtown Seattle waterfront, was a welcome move that turned out well. The room for the festival was plenty large, and although the festival was sold out for both sessions, the WA Beer Commission did not allow the space to get overcrowded. It is great to see so many breweries making quality Belgian-style beers these days, especially sour beers. When I moved to Seattle seven years ago, there most definitely was not an abundance of sour offerings from Washington breweries. For this year’s Belgianfest, there were no less than ten breweries pouring sour/wild ales. This makes me a happy man. This offering from the University Village location of the Ram was a full-flavored beer with a nice balance of sour fruit and dark malts. There were no off flavors whatsoever, and it really just came together perfectly. The sourness wasn’t overwhelming, and I couldn’t help but have a couple of these. This was a Belgian Wit brewed with tart cherries, pomegranate and pink peppercorns. As odd as that combination may sound, it was pretty fantastic. The unique flavors were well-balanced, and the fruit and peppercorns really came through nicely. I’m not sure I would want more than a 4oz sample pour of it, but that’s okay by me. Like I even need to call this one out. My first beer of the day was the Bourbon Barrel La Petite Mort. It was really good, but it didn’t quite “wow” me like it did previously. I was sad to miss out on their cask of Belgian-style IPA, which they stopped pouring in order to save some for the second session (cheers to them for that). But, I also sampled their Biere de Garde, which was fantastic. There is a reason why these guys always have the longest line. They were right next to the long line at Black Raven. They only had a single offering (a Belgian Session Ale called Allocation), and people weren’t exactly lining up to try it. I did sample it, and it was pretty solid. It’s the type of beer that will have a difficult time standing out at a festival full of sours and strong ales, but it was a well-made, sessionable beer for sure. I just felt kind of bad for the rep pouring their beer. Yeah, I’m predictable. By the end of the session I was needing some hops to balance out the strong ales and sours. I really enjoyed the Diamond Knot Belgian IPA, but the Elysian Backhanded Compliment was quite good as well. This has become a great festival that I will definitely be looking forward to next year. I thought that The Ram’s Sour Diesel was the most sour beer of the day. It had nice punchy acetic acid notes that tingled the throat. Well done. Big Pucker was my favorite sour with the Anacortes Sour Red and Ram Sour Diesel tying for second. Good times. So impressed with Engine House #9 Brewpub. If you haven’t been there in awhile – their beers and the guest beer drafts are so much better. And the bottle selection and prices are also great – Black Xantus for about $15! I also enjoyed the Kriek at Belgianfest. +1 for Engine House 9. I missed out on their kriek but their bourbon barrel saison was fantastic. I also had problems with palette fatigue of sours about halfway through. Many were good but I hope that next year more breweries will experiment with Belgian styles that don’t require souring yeasts. 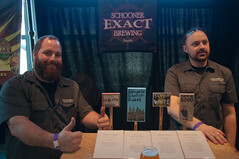 You missed Elliot Bay Batch 1000, it was my favorite beer of the festival, but I do have to give The Ram kudos for the best complete line up, every single one of them was a break away from their normal beers. Nate MC – I had a couple people at the fest tell me they loved the Batch 1000 as well, and I got a sample. To me, this beer was the perfect example of how people taste differently. I got a large dose of diacetyl that made it a bucket-pour for me, while not everyone else did. Some people are more sensitive to diacetyl than others, that is for sure. I’ve become more sensitive to it over the years and now even a bit of misplaced diacetyl can ruin a beer for me. If you didn’t pick up the same flavor, count yourself lucky. Engine House 9 Petite Sour was my favorite sour! The Kriek was good, but was missing that hit of cherry that I want in a Kriek. The Black Raven cask was their Saison w/ brett, which was my favorite of the day. The “Raven de Garde” (if memory serves) was their Belgian IPA, which isn’t a style that I’m a fan of. I didn’t notice anyone with a Biere de Garde, which was too bad. My second favorite on the day was the Schooner Exact Biere de Sodo – very Orval’ish, with a slightly fuller mouthfeel and a prominent hop character. Really nicely balanced and drinkable. The Hilliard’s E.S.Belgian was also one of the cleanest and most enjoyable beers on tap. The American Brewing sour was the least balanced beer I had, very rough around the edges and hard to enjoy. The Petite Mort was overwhelmed by barrel character – very tasty, but not something I could drink a whole pint of. I tried to grab every Saison that was on and was mostly unimpressed, definitely a weak spot. The whole event was fantastic, although I would love to have seen more breweries doing well by traditional Belgian styles and little less riding the hype train. Also, the guy pouring for Redhook at the first session was Nick, one of the brewers. His beer was really nice and judging by the lack of a line certainly one of the most underrated beers of the day. That sample was definitely towards the end of the festival (after quite a few other samples), and I didn’t take notes or a picture of their booth, so I’m assuming you are indeed correct. Thanks for the clarification.